Volatility has been generally subdued so far this year. In the latest rebalance, the S&P 500® Low Volatility Index’s most significant sector shift was to Financials (adding 5% to bring the sector to 21% of the index). Allocation in the remaining sectors did not deviate too far from the last rebalance. 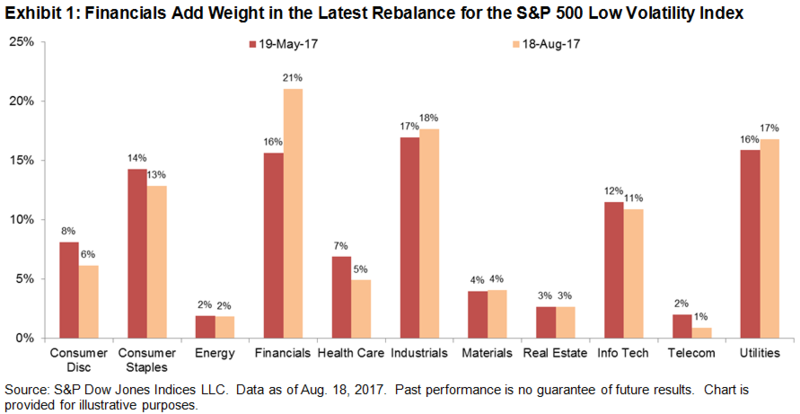 Technology’s weight, which increased significantly after May 2017’s rebalance, declined 1% but is still more than one-tenth of the index. The methodology for the S&P 500 Low Volatility Index screens for constituents at the stock level, but using S&P 500 sectors as a proxy is often helpful in gaining a better understanding. The trend of declining volatility persisted in all but the Telecom sector (see chart below). Not surprisingly, Financials was among the sectors that declined the most in volatility.